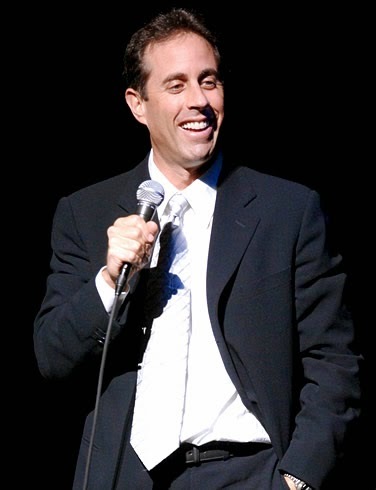 That's what Jerry Seinfeld says about our children. They look innocent enough, but their ulterior motives are not remotely hard to figure. To that end, one of my students took over my class last week. She decided she could do as well as me, and commandeered my notes. Actually she did not do all that badly. The students gave her less of a hard time than they gave me, and were generally amused by her. She understood the material very well. I had to tell her to ask the questions first and call names later. She asked my why and I told her if she said the names first, only that person would actually listen to the question. Still, I got in trouble. The girl sitting next to me raised her hand and claimed I was bullying her (I wasn't). I was pretty surprised she even knew that word. I had never heard her accuse anyone of such a thing before. The girl teaching the class made me sit in the back. None of that innocent until proven guilty stuff that day. There were a lot of remarks about the troublemaker in back of the class, and corrections made by me were questioned pointedly. After all, who can trust the guy the teacher made sit in the back? I don't want the master teacher gig, so I don't have to sit and hope my students take over my classes on a daily basis. But the problem with using Danielson as a rating rather than guidance tool is that highly effective entails circumstances not precisely within your control. Students are simply not predictable, and you will have good days and bad. With particular groupings, any class could lean one way or the other. I do everything I can think of to make my class a positive environment, and I really try to shape the culture, but I'm just one person. Within the culture of a classroom, one person, depending upon who it is, can make a big difference. Having a kid who's willing to get up in front of the class and take a chance like that is great when a supervisor walk in. On the other hand, one disruptive kid can change the environment a lot too. I had one kid absent from one of my classes on Friday and it made my life a whole lot easier. You don't realize things like that until they come up. If your classroom is a lively place where kids feel free to express themselves you cannot predict from one day to the next what will happen. That's the kind of classroom I want to be in, even if it's a little noisy from time to time. I don't want the room out of control, but I want it right on the cusp. I always hope I get kids who will work with me so I can leave it right there. But I never know what's going to happen. I can't just write a lesson plan and make it hit every Danielson bell. A lot depends on the kids who are with me, and I never know what they're going to do. That's one of the reasons I keep coming back.